‘Round about July, Bicycle Magazine featured Harry’s Hundred, the training ride for the South Broward Wheelers Century Ride. Harry’s Hundred caught my eye. Unfortunately, it was on hiatus for the summer. Alas, I have not yet knocked out a century for 2008. Fast forward: the 24th Annual South Broward Wheelers Century Ride is darn near here: November 2, 2008. There are three distances available (32, 62 and 100 miles). All start from Brian Piccolo Park in Cooper City, Florida. The long distance riders start at 7:30 am while the 32-mile ride starts at 8:00 am. I haven’t seen a 2008 route map but you can grab the 2006 South Broward Wheelers Century Map in PDF format from their web site. Registration costs $30 for non-members and includes a commerative t-shirt, lunch, fully-stocked rest stops, sag wagon, etc. That is a wonderful deal and well worth the price. Others (I’m looking at you, Dad) will complain about having to pay $30 to ride on roads that are free and open to the public. I look at it this way: with fully-stocked rest stops, I only have to carry enough food and water to get me the 10 or 15 miles to the next rest stop instead of having to carry six hours worth of stuff. With a support staff, I can ride quicker and easier. That’s worth $30 even without the t-shirt. For $30, I didn’t give much thought as to where my money was going. I figured rest stops, t-shirts and beer for the club officers. It turns out, this ride is well sponsored and the majority of the sponsorship support goes to buying bikes for the community. 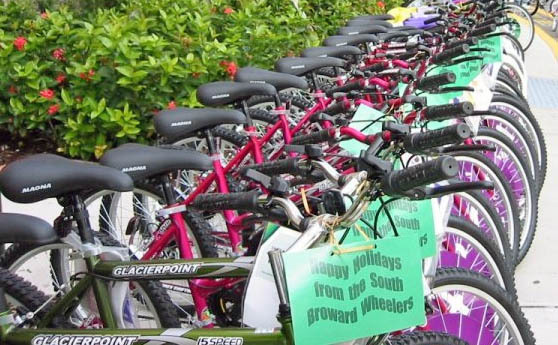 Since 2002, SBW has donated over 1,000 new bikes with helmets to various Broward County charaties with a strong focus on children. Are You Riding or Hiding? Grab your entry form today. Get it in before October 24 and you’ll save $5. There is a 93% chance that I’ll do this ride. I’ll be happy to take myself and three others south from Palm Beach Gardens. You can enjoy my company or sleep on the way south. Your choice. Comment below to let me know you need a ride. I don’t have a problem with the entry fee. It’s worth that to get a good route map. As far as counting on rest stops, I have been on too many group rides where the promised rest stops weren’t there or they were out of stuff. I ride to be self sufficient. Rest stops are a bonus.